Since working with Joel Meyerowitz, I’ve been mesmerized by the horizon. His classic “Bay/Sky” images inspired my photography both in the Hudson Palisades series and here in Cape Breton. I hadn’t intended to focus on photography during my time here, but as I looked through my casual daily shots, I realized there was something happening. Winter on the west coast of Cape Breton is subtle in its beauty but sharp in its elemental push. There are hundreds here in the glory of summertime who vacate in September, leaving behind a few hardy souls. Winds whip through the highlands or off the Gulf of St Lawrence approaching hurricane speeds and drive continuously changing weather throughout the day. One day, the temperature swung 40 degrees (farenheit) in less than an hour. Once the sea ice fills the Gulf, however, the winds tame, the sun is out more, and there’s quiet pierced only occasionally by the caw of crows, the whine of weekend snowmobiles or the periodic scrape of the snowplow on the Cabot Trail. More images at www.susantylerjenkins.com in Other Work. 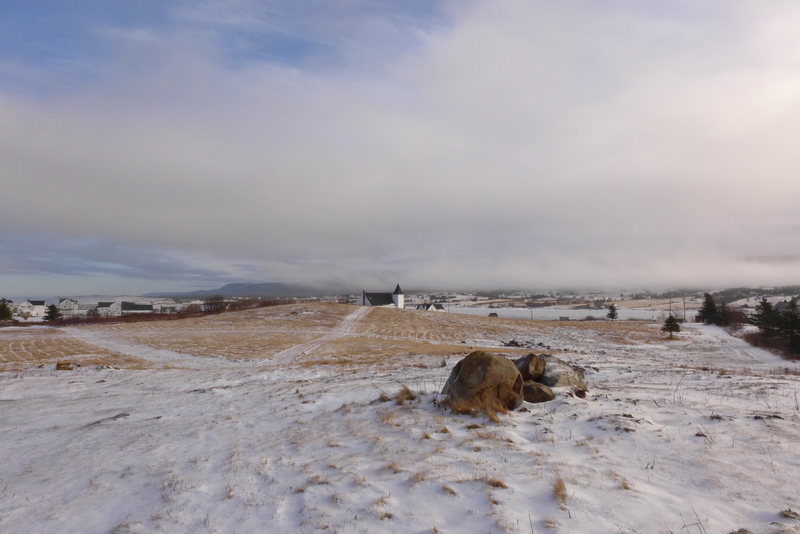 March 6, top of the Shore road in Margaree Harbour.